Since our inception over 77 years ago, Frank Ferrara & Son, Inc. has remained committed to recycling and other forward thinking environmentally responsible programs. What many years ago was called resourceful building, is in some respects today called green building. Why build harder when you can build smarter? 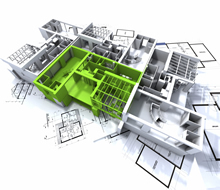 We are excited to provide Green Design-Build services as well as Green Home and Commercial Retrofit services to address all facets of our clients' needs. Find out how going green can be easy and government tax credits and rebates make it sweeter, saving you thousands of dollars each year! Efficiency and resourcefulness has always been our strength, let us help you make it your savings. Frank Ferrara & Son, Inc. works closely with area recycling facilities to help reduce the amount of trash entering America’s landfills. We recycling stone, metals, plastics, papers, and any possibly environmentally detrimental items removed from each and every one of our job sites where practical. Frank Ferrara & Son, Inc. understands the importance of green and environmentally friendly construction and we will continue to strive for advancements in green construction techniques. Environmental protection is an important responsibility and Frank Ferrara & Son, Inc. will continue to do its part as a community leader and promoter of green building practices. As prices for home electric, heating, and cooling rise, can you be sure where your money is going? Let us do a free, no obligation, in-home consultation to determine what simple changes can have dramatic effects on your utility bills. We can provide you with recommendations for replacing older appliances with new energy efficient appliances and we can also determine how efficient your windows, doors, and insulation are are at regulating weather conditions. When you are ready to update your home, we will sit down to develop a customized package to address any possible concerns you may have. We will even show you how you can upgrade your home windows, appliances, insulation, weather stripping, and more using free government stimulus and tax break options.